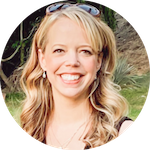 As a mom to two toddlers, I’ve been asking myself: When is the right time to potty train your child? for what feels like a very long time! My husband and I decided to potty train Haiden, (now two and a half) just after his second birthday. He knew what the potty was for, I had just transitioned to being a stay-at-home mom, he was signing “potty” all the time and it just felt right. Let me tell you, those few weeks of were a learning experience for all of us, but potty training Piper was an altogether new and different experience. In a hurry? 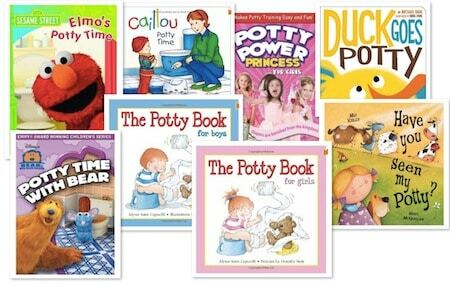 Click to get your printable potty training readiness checklist now! 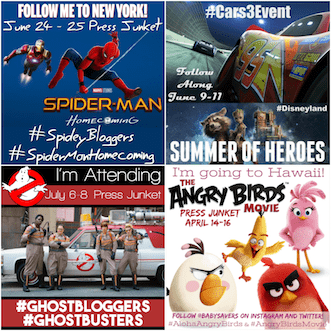 Share this post by pinning it on Pinterest! Piper is now almost nineteen months old. I’m not going to say that she was showing all those signs of potty training readiness or that she was telling me she wanted to use the potty, because she just wasn’t. Truth be told, Piper’s only been walking for just over three months, and her verbal skills aren’t that great. Regardless, I had a feeling she was ready to start using the toilet. My mom would take Piper to the bathroom whenever we were together. She had great success. According to my mom, Piper knew how to “hold it”. Haiden’s been using his potty chair and a big toilet like a champ for about seven months. Haiden and Piper are always together, so I knew he'd been setting a good example for her. Piper’s just smart. She a great listener, and she definitely comprehends what I tell her. Really, that’s it. She wasn’t asking to use the potty, she didn’t have consistently dry diapers during nights or naptime, and she wasn’t telling us when she was filling up her diaper. My husband was skeptical, but he was supportive in my thoughts that we should give potty training a try. Also, my potty training “plan” was only concerned with daytime use of the potty. My husband and I agreed that staying dry during naptime and overnight would come naturally after Piper started using the potty regularly during the day. We’re in Minnesota, and we had a long stretch of ridiculously cold weather several weeks ago. The below-zero temps kept us homebound, so it occurred to me that this would be a good time to start working with Piper on using the potty. Day 1 (Thursday): I took off the diaper Piper had worn overnight, then dressed Piper in a cozy shirt, socks and ridiculously cute baby legwarmers to keep her warm. She didn’t wear anything on her bottom. No underwear, and no pull up. Day 1 Results: Not good! My stubborn daughter would say “NO!” every single time I asked her if she needed to use the potty. She cried when I put her on Haiden’s potty seat. She peed on the floor in several areas. When my husband got home from work I asked him to take her on the potty and she went for him with no issues at all. Lesson learned: she didn’t want to cooperate with me! Day 2 (Friday): Piper spent all day without underwear again. She used the potty a few times and she got a chocolate chip each time she used it. She did, however, have several accidents and spent much of the day telling me “NO!” when I asked her to use the potty. I'd noticed that Piper was having a hard time sitting down on Haiden’s Baby Bjorn potty chair (pictured above). At eighteen months, she was a little short to get on there by herself. Plus we had one stressful squabble when they both wanted to use the potty at the same time! I decided that Piper needed a smaller potty to call her own, so I went online and ordered this little red potty seat just for her. After two days and plenty of accidents, I called my mom and told her that Piper’s potty training wasn’t going well. We had plans to spend the weekend with my husband's parents, and I knew that the potty training wasn't going to get better while we were there. My gut told me that I shouldn’t put her back in diapers, and my mom agreed. She suggested using waterproof training pants for the weekend then getting back in the potty training routine when we were back home on Monday. I took my mom's advice, packed a bunch of training pants and we left for a Saturday and Sunday away from home. Piper was struggling with using Haiden’s potty seat. It was just was too big for her. Piper’s stubbornness was hindering our progress. She just didn’t like being told what to do! She needed more opportunities to use the potty. Number one (no pun intended!) was already taken care of. I had already ordered a new (smaller) potty with Amazon Prime. 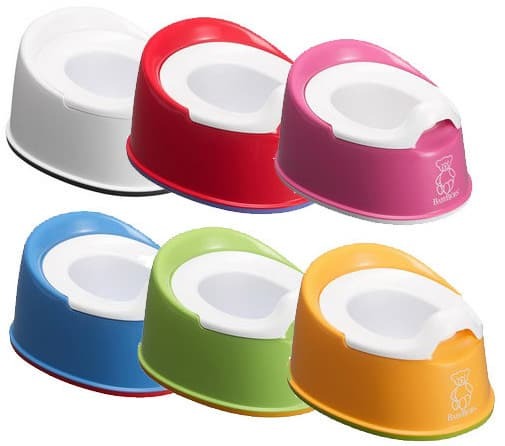 Their awesome two-day shipping meant that Piper’s new little potty was scheduled to be at our house on Monday morning. Once the new potty was set up, I was going to give her plenty of juice (to solve number three!) to get the day going. The biggest thing I decided was that I was going to stop asking her if she needed to use the potty. Note: Piper's new potty was the Baby Bjorn Smart Potty. It's available in a variety of colors from Amazon. We relaxed our potty training “push” over the weekend and left my in-laws house with a bag full of disgustingly dirty cloth training pants and a new attitude for the week ahead! My plan was to read the books to both Piper and Haiden as part of our normal reading routine, and watch the DVDs if we could fit them in. Want to know how Piper did with potty training when we started again the following week? 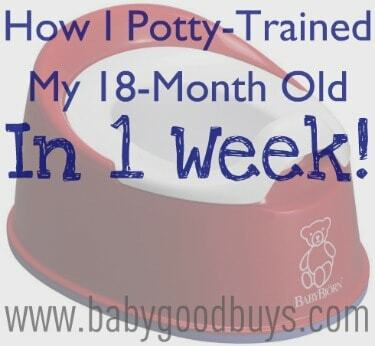 Read PART 2 of our potty training adventure! 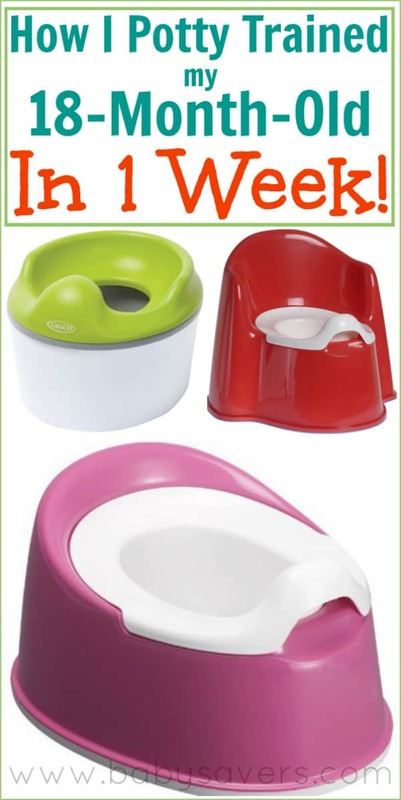 Don't forget to create a fun environment while potty training! 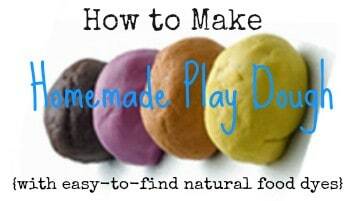 Learn how to make homemade play dough with natural dyes! Continued?!! I’ll be looking forward to it! My daughter is 17mo’s! Also, I love the picture of Piper! She is beautiful! Can you update the link to the potty you ordered for her? It’s not working currently and I’d love to see what you picked out. Thanks! !!! Where’s the rest! I was just getting excited to see how it was going! I’ve got a two year old boy who seems to have no clue that he’s ‘going’. Even in the shower he is amazed that he can pee. .. I want him trained, but I just don’t want to start too soon either! Looking forward to Part 2! I enjoyed the story…didn’t seem long at all because it was exciting and oh-so-relatable! Yes I want to hear more too, I have a 26mos old we’ve been trying potty training for a while now too. We stopped because he just won’t go on the potty, he’ll hold it and go at night or naptime, he holds it really well. He loves sitting on the potty but doesn’t want to use it. I dont know what to do….. If I hear, “NO!” one more time I might pull my hair out. Both my boys were PTs before 2. I think you are right, you have to train them before they get used to the diaper. One way to be ready is to already have the potty in the bathroom before you even think about training. And with boys, having a role model (aka daddy or big bro) helps too. I would love to try this but I’m concerned about poop accidents. How did you combat those? Wow I was reading this and kept thinking ……. This mom’s problem is that she’s asking her little one if she has to go potty! This always gives them the chance to say NO! All along I kept thinking don’t ask her, just take her by the hand and put her on the pot as a matter of fact sort of approach. Bingo this is what I’ve been preaching to my friends and even the pediatricians I work with whom by the way are parents of little one’s still in diapers. I work in a pediatrics office and people even ASK their kids if they will get on the scale! Drives me nuts because they cry and wont do it! I always say don’t ask just put them on it. Also it’s like saying NO my kid doesn’t like broccoli when someone offers it on their plate. STOP saying stuff like that it just instills it in their brain people! well i appericate your advice! 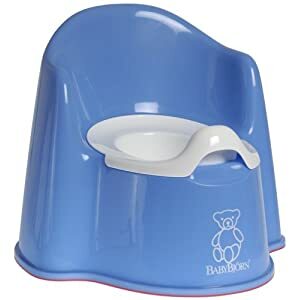 so my son is 23 mons and he likes going potty byt he really dont know what it is whenever he goes potty he looks and says water im wondering if its too soon to be trying or what he likes the big potty better but i dont know if hes ready? Sarah, you’re at risk of poop accidents regardless of the age or “readiness” of the child being potty trained. I had one terrible mess with Piper in our “do over” week. I got through it and I think of it as sort of a battle scar that I can use to entertain other moms 🙂 Believe me, I’ve heard WAY worse than the little mess that I had to clean up. Overall, I think you just have to trust that your child knows what a diaper is for. If he/she isn’t wearing a diaper, then she knows that the potty needs to be used. If you have an unbearable amount of accidents, or if you’re TOO worried about them, then the timing isn’t right or the method may not be right for you. It’s not a contest everyone! If you’re baby’s ready, that’s awesome! If you’re just done and need to get that toddler using a toilet, that’s also okay, but when and how long it takes your child to potty train has NO reflection on your skills as a parent or your child’s cognitive ability. We already put so much pressure on ourselves as adults, do we need to set our kids up for this high-pressure mentality that early on?